Interested in participating? Please contact LYRASIS for pricing and program eligibility. “Sidecar” plain text versions of each image’s OCR data (required for loading images into searchable databases or content management systems such as CONTENTdm). 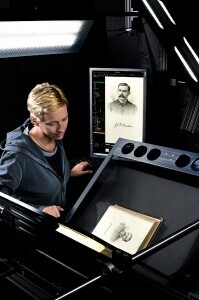 Microfiche will be scanned at 300dpi true optical resolution to the file types listed above. Step & repeat, jacketed fiche, and COM formats are all eligible for conversion, up to a maximum of 48x reduction. All microform digitized by Creekside Digital for the LYRASIS Digitization Collaborative is scanned using nextScan production-class microfilm scanners in order to achieve the highest technical image quality from microfilm available today, at any price. Various options are available on microfilm and microfiche projects, including 2-up splitting, organization of output images by book / issue / volume, and metadata such as METS / ALTO structural XML. While millions of pages of bound books have been successfully digitized through the LYRASIS Digitization Collaborative by Internet Archive, not every collection is a good fit for their service. Copyright status, condition, or size sometimes prompt LYRASIS members to look for additional conversion options. Creekside Digital’s customers own their book scans, and the files do not need to be made freely available via archive.org or any other website. We also retain all pages edges during our standards-compliant book digitization process, and can handle fragile works as well as bound volumes up to 17″ x 25″ in size with bindings up to 6″ thick. Full-color TIFFs will be converted to the Adobe 1998 RGB ICC profile upon output. PDF files created from bound books will typically be multipage PDFs (one per volume) unless single-page PDF files or some other type of segmentation are requested as part of the project order. Full METS / ALTO structural XML in lieu of OCR text file is available as an option. Creekside Digital is pleased to digitize all newspaper project pages in full-color as a no-charge option. By default, newspaper scans will be foldered per issue. PDF files created from newspapers will typically be multipage PDFs unless single-page PDF files or some other type of segmentation are requested. METS / ALTO structural XML is available in lieu of OCR text file as an option. Creekside Digital converts both reflective photographic materials (prints) as well transmissive photographic materials (such as slides, film, transparencies, and negatives) for the LYRASIS Digitization Collaborative. 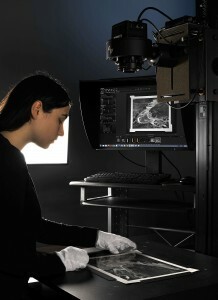 All photographic materials converted by Creekside Digital for the LYRASIS Digitization Collaborative are digitized by trained photographers using Phase One 80 megapixel digital backs and other equipment specifically designed for standards-compliant, high-quality conversion of fragile cultural heritage materials. Full-color TIFFs will be converted to the Adobe 1998 RGB ICC profile upon output. Images will be cropped to the edge of the print (retaining the visible edge of the paper) and deskewed. By default, only the front of each print will be scanned. Optionally, the back of each photo can also be digitized upon request. Full-color TIFFs will be converted to the Adobe 1998 RGB ICC profile upon output. Images will be cropped to the edge of each frame (and up to 1/4″ over) and deskewed. By default, no automated dust / scratch removal algorithms will be used. For negative film, Creekside Digital will invert the polarity of each capture to generate a positive image. By default, we also adjust settings such as levels and curves yield an aesthetically pleasing positive, as would be done during a traditional analog printing process. Polarity inversion and related processing can be omitted for LYRASIS Digitization Collaborative participants who prefer as “as-shot” negative master files. Full-color TIFFs will be converted to the Adobe 1998 RGB ICC profile upon output. Images will be cropped to the edge of the paper (retaining the visible edge of the paper and up to 1/4″ of overscan) and deskewed. From time to time, Creekside Digital personnel participate in LYRASIS webinars related to the LYRASIS Digitization Collaborative. Many prospective program participants find these webinars to be helpful illustrations of what to expect when sending a project through the program. Additionally, past participants often present as well and share their experiences. The schedule of all LYRASIS Digital classes and webinars, including those related to the LYRASIS Digitization Collaborative, is available here. For more information regarding any of Creekside Digital’s preservation-class digitization services available through the LYRASIS Digitization Collaborative, including pricing and eligibility details, please contact Hannah Rosen, LYRASIS Licensed Services Coordinator, at (800) 999-8558 x2918, or email her at hannah.rosen@lyrasis.org. Creekside Digital shared a post. The Digitization Program Office (DPO) is pleased to present its 2018 Annual Report outlining the work and special activities that took place over the course of the year. DPO works to implement a vision of “Discovery through Digitization” by partnering with others to increase the quantity, quality, and impact of digitized Smithsonian collections.